When it comes to romantic places to propose in South Africa, there is a wealth of choice. One particular destination, however, stands out head and shoulders above the rest. The beautiful city of Cape Town and its magnificent surrounding areas have been capturing the imagination of thousands of couples getting engaged – travellers and locals alike. Aside from being a world-class destination for engagement ring shopping, the Mother City has an array of spectacular restaurants, wine estates, adventures, nearby luxury getaway spots and breath-taking natural backdrops that are just perfect for an unforgettable proposal. But with so many places to propose in Cape Town, we understand the quest to find that magical spot can be somewhat of a task. Therefore, we’ve selected a few of the most romantic locations the city has to offer, which might give you some great ideas on where to propose in Cape Town. With so many beautiful places to propose in Cape Town how does one choose one location over the next? Our advice is to tailor the experience to suit your soul mate’s personality and style. If she is a true romantic at heart, a scenic hot air balloon ride over the Cape Winelands could be truly magical. You will launch from a picturesque site situated between Stellenbosch and Paarl, approximately forty-five minutes’ drive from the Mother City, then watch as the magnificence of the rugged mountains, sweeping fields and rolling vineyards unfold as you rise towards the clouds, away from the bustle below. The operators, Air to Air Africa, guarantee the ultimate hot air ballooning experience, finished off by the customary glass of bubbly when you land – the perfect way to celebrate that much anticipated “yes”. There are many romantic ways to propose but only one chance to get it absolutely perfect. If your significant other is a private person with a sense of adventure, why not whisk her away for a romantic weekend at Bushmans Kloof Wilderness Reserve & Wellness Retreat? Nestled in the foothills of the Cederberg Mountains, this spectacular reserve is just the place to set the stage for an awe-inspiring proposal. The elegant Riverside Supreme Suite is a secluded haven on the banks of the Boontjies River, featuring a private heated infinity pool, outdoor shower and large private patio with spectacular views of the wind-sculpted rock formations – the perfect setting to get down on one knee. If your partner has an appreciation for the finer things in life, a sensational dining experience at one of the country’s best restaurants may just do the trick. Headed by Executive Chef Guy Bennet, The Restaurant at Grande Provence Heritage Wine Estate might arguably be the best place to propose in Cape Town if you consider yourself foodies. Situated in Franschhoek – the gourmet capital of South Africa, Grande Provence offers the best of old and new – a multi-sensory experience where modern cuisine pairs perfectly with classic wines against a mesmerising backdrop with a 300-year history. Whether you opt for the meticulously plated à la Carte lunch or a delectable four-course dinner, the experience guarantees to present the perfect romantic moment to ask the big question. If you are looking for romantic ways to propose that are completely different from the clichés, you might consider a trip on the legendary Blue Train where luxury takes on a new dimension. The elegant lodgings and attentive butler service in this moving five-star hotel are quite literally fit for kings and presidents. The two-night, 1600-kilometre-long journey from Cape Town to Pretoria is interlaced with extravagance and comforts, especially if you book one of the Luxury Suites. Think immaculate mahogany, Wi-Fi, goose down duvets and pillows with percale cotton bedding, and marble and gold-appointed bathrooms with long bathtubs. One of the most remarkable experiences on the journey is dinner – a special banquet during which travellers don themselves in their finest satins and silk, ties and tuxedos to enjoy the chefs’ tantalising cuisine, followed by Cognacs and Cuban cigars in the lounge, before retiring to bed. This opulent adventure truly makes for a one-of-a-kind proposal. What makes the Mother City one of the most romantic destinations in South Africa – and the world – is her spectacular mix of ocean and mountains. If you are looking for the best place to propose in Cape Town, consider a viewpoint from where you can admire the city in all her glory – framed by the blue of the shimmering ocean. This viewpoint, second to none, is aboard the Mirage, South Africa’s newest and largest private yacht. The flybridge offers unobstructed views from where you can marvel at the splendour of the city and watch as the darkening dawn covers her with a glimmering blanket of lights. Whether you want to plan a sunset cruise for just the two of you or celebrate this happy occasion with your closest friends and family, the Mirage and its world-class crew are ready and waiting to help you create lasting memories and make your dream proposal a reality. For a truly magical and unique proposal, arrange a visit to the Cape Town Diamond Museum. Situated at the Clock Tower, Waterfront awaits a magical world of diamonds like you’ve never seen it before. Whisk her away to the coveted harbour for a unique diamond experience before making an ‘impromptu’ visit to the Shimansky showroom. Casually suggest to your significant other to try on our selection of internationally patented diamond cuts, before asking her which engagement ring she prefers. Make her dreams come true by getting down on one knee, right then and there with the perfect ring. 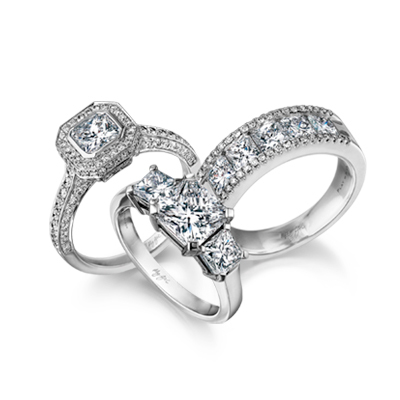 Our diamond experts will be sure to organise a variety of ring options ahead of time. Celebrate the beautiful moment straight after with a glass of champagne at the exclusive bar inside the showroom. This is definitely a proposal she will never forget. A carefully planned proposal is one of life’s most important milestones – it’s a special moment in time eternalised by the memory you share. To find an engagement ring that is just as spectacular as the proposal, visit a Shimansky showroom near you. We have an unmatched range of unique engagement rings – from the original My Girl diamond ring to the one-of-a-kind iconic Millennium diamond ring. Our specialists will be happy to give you expert advice, whether you are planning a surprise proposal or ring shopping together.